2019 DealerRater Consumer Satisfaction Award: Salerno Duane Wins! 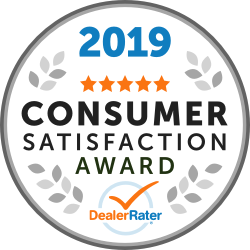 We would like to thank our loyal customers and our hardworking staff for making it possible for us to once again receive the 2019 DealerRater Consumer Satisfaction Award! This measure of customer satisfaction comes from our DealerRater PowerScore rating being in the 10% of franchise dealers in the U.S. The PowerScore gets calculated by using Bayesian algorithm that considers our average star rating on the site, as well as the total number of reviews written on the site about us during the 2018 calendar year. Reviews on sites like DealerRater help us see how well we’re meeting or exceeding your lofty expectations. We’ve previously earned the DealerRater Consumer Satisfaction Award in 2017. “”I was ending my current GMC lease and wanted to look at the Dodge Durango. I had reached out to Sergio Ovalle. He was great to work with for many reasons. First off he was responsive and listened to what I was looking for. He was not trying to sell me something that was more just to make a sale, he really cared about getting me into the Durango I wanted.